Video Description: Yoke Rig. 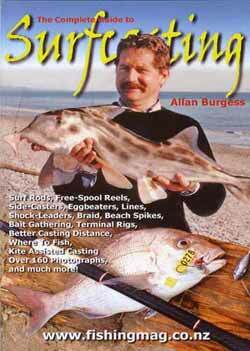 Use this surfcasting rig when casting as far a possible is your main aim. On a shallow sandy beach sometimes you might have to wade out 100m and then cast another 200m to reach a distant hole or gutter. In this situation, the Yoke Rig comes into its own. In this series of videos, we are going to be making our own range of shop-quality surfcasting rigs. Different rigs are used in different fishing situations depending on factors such as target species, how far you need to cast, possible by-catch species you may encounter, how strong the terminal rig needs to be, and so on. I’ll be showing you many of the different components available along with some you can make yourself. Tying your own surfcasting rigs will not only save you money it will also mean you’ve got just the right rig to fish no matter the conditions. Making up your own rigs will set you apart from other anglers. You’ll be able to try different things to build up your knowledge as time goes by. You can get all sorts of Specialist Surfcasting and Fishing Accessories online from Tackle Tactics. Always endeavour to tie your own terminal tackle at home rather than at the beach. This will save you a lot of wasted fishing time. It’s a good job to get done over the winter months during the long evenings when there’s otherwise not much happening on the fishing front. Save your completed rigs in clear zip-lock plastic lunch bags after you first write on the outside a description stating which type of rig it is, line-weight and hook size. Doing so will make it a lot easier later on to find the exact rig you are looking for. 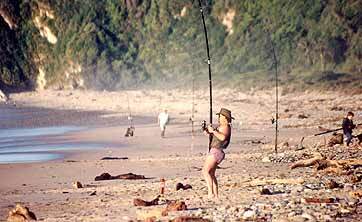 The Yoke or Pulley rig is a firm favourite with North Island surfcasters in search of snapper. According to Denis Moresby, a veteran of Northland’s famous Ninety Mile Beach Surfcasting Classic, this is a popular rig fished by seasoned contestants. The focus of this rig is on long distance casting. On shallow sandy beaches it can sometimes be necessary to wade out as much as 100m, and then cast another 150 to 200m to reach a hole or gutter holding fish. In this situation, the ability to make a good long cast can mean the difference between catching a snapper or remaining fishless! The sliding hook clip used on the Yoke Rig. It is made from stainless steel wire. This particular Yoke Rig features a home-made stainless steel clip which holds the hook in place while it is being cast. This is to prevent the dropper/trace from flying around which produces considerable wind resistance thereby greatly shortening the length of the cast. Alternate hook clip down method made by snipping a piece off a Genie clip and opening the eye and joining it to the swivel. I would also bend the top of the Genie clip open a little more. The Yoke Rig is designed to achieve the best casting distance possible. Hence the reason we have used just one kook. You can add a second hook on the same trace shown in the video. 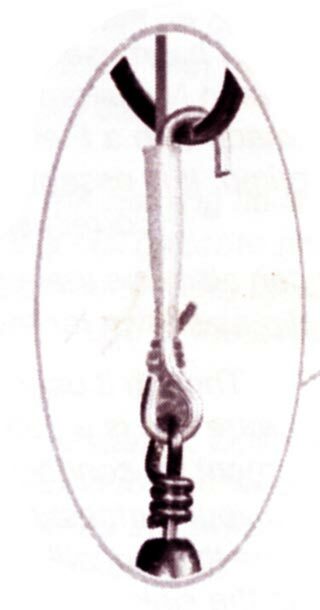 The second hook can either be snelled in place 70mm above the bottom one or made to slide along the trace with a stopper arrangement. This makes it possible to use a larger bait like half a mullet. When you bait up the Yoke Rig it is well worth taking the time to use plenty of bait elastic to secure the bait to the hook. A lot of pressure will be applied to the bait during casting and you don’t want if flying-off. 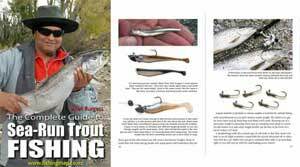 As you will have just the one bait out you’ll also want to do as much as possible to keep it on the hook until a good fish spots it and not have it prematurely taken by “little pickers” like mullet and spotties. When your sinker hits the water your hook pops free from the clip. Then have a stray line 900 millimetres long washing around in the current. When a fish takes the baited hook it can swim off with it until the line tightens on the sinker setting the hook. you might have to wade out quite a long way before you even make a cast and then walk back again. If the line does break during casting, particularly during a fishing contest, you’re going to waste quite a bit of valuable fishing time. The best idea and the fairly standard practice is to tie the backbone from 80-pound monofilament. This gives you a bit of extra strength up your sleeve should you hook a shark with its abrasive skin rubbing on the line. The backbone is also bent back on itself at the Genie Clip creating another potential weak point if a lighter line is used. With 80lb monofilament line allow an extra 300mm to tie a Uni-knot at each end. We are going to make the finished backbone 600mm long so begin by cutting a length measuring 1200mm from your roll of line. This allows plenty of room for tying your knots. To make this rig you will need two size 5 or 6 swivels (8o – 120lb test). Plus a third swivel that you tie to the end of your mainline. I have used a red Jarvis Walker chemically sharpened 6/0 Suicide hook in the video. These hooks are super sharp, very strong, and reasonably inexpensive. They will take smaller legal size snapper all the way up to the big boys. 6/0 size hooks are ideal for general surfcasting. I wouldn’t go any bigger.